Most people are well aware of VMware vCloud Connector at this stage of the game. If you are not, it is a FREE tool you can use to copy virtual machines between clouds. Notice I did not say “vCloud’s”, because you can use this tool to move virtual machines between both vSphere and vCloud based clouds. You can copy from vSphere to vCloud providers like vCloud Air, from vSphere to vSphere, or from vCloud providers to vSphere. In regards to how it handles the process, it’s had its challenges but it’s definitely easier than doing it manually. However, there is one feature when I talk to people who is probably the least-used feature known as Content Sync. What is vCloud Connector Content Sync? 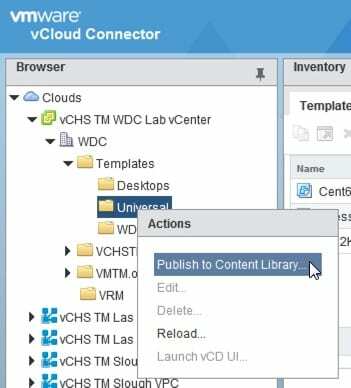 Simply put vCloud Connector Content Sync is the ability to publish various items in vSphere or vCloud to other clouds and in turn “subscribe” those clouds to those published content items. This takes a little planning and thought because in most use cases the source is vSphere and you publish a folder which will include all the items in the folder. So if you only want to publish certain items, you might ned to do a little re-organizing first. You can see below I can select any folder including a sub-folder. Once you publish a folder and it’s content you can then select the clouds to “subscribe” to the contents as well as updates made to that content. You can see below you can choose from any or all of the clouds you have configured in vCloud Connector. Now that you have subscribed to the content, the clouds will be updated once a day with the templates. If you make no changes, nothing will happen after the first sync, but as you update them the changes will be pushed to the other clouds automatically! The great thing is for YEARS people have been trying to keep templates in sync between multiple vCenters so now you can do it pretty easily and the tool is free. As you grow out into the cloud with vCloud Air, you can then add that end point for subscription and get all your templates in your cloud as well. 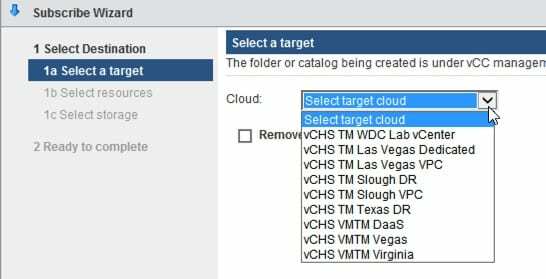 One additional thing you can do here is if you become a subscriber to vCloud Air Disaster Recovery is use this feature to make sure your templates are in the DR location. All it requires is enough storage for them, and creating a catalog on the disaster recovery vDC. This is useful because the vSphere Replication technology used to replicate machines from vCenter to vCloud Air-DR requires machines to be powered on. Using this feature they can even remain as template items in your vCenter with no need to convert to virtual machines, power them on, replicate them, etc. If you have not yet tried vCloud Connector Content Sync, why not? Go download it get the appliances installed and stop the hassle of managing your templates manually from cloud to cloud. I seriously thing this is the least-used feature of the product and it works really well!